The first volume of the dementedly funny 80’s nostalgia series, The Poniworld Chronicles, introduces us to MachoPoni. He’s a purple pony who tries to act tough, but has a heart of gold. And his heart has a soft spot for a female pony named Dust. He’s loved her ever since they were children, though many would call him a fool for doing so. Because most ponies would call Dust cruel and manipulative. But the part of her that MachoPoni fell in love with, is a part deep inside that she doesn’t show to others. 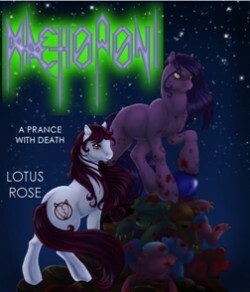 So when Dust is kidnapped and taken to the land of undead ponies, MachoPoni has no choice but to rescue her. This is the first of a series of books that are darkly humorous, twisted parodies that children shouldn’t be allowed to read. They’re for those of you who want to revisit your childhood, but from the perspective of the slightly-off adult you’ve become.